By now history and geography had crept into our day. The history (Scottish) stories were quite interesting, but remembering all the dates was a nightmare. Geography meant learning all the counties in Scotland then England, but now they are all changed and I have trouble knowing where any boundaries are.The big map of The British Isles that hung on the wall in Miss Arnott's class will be a collectors item now. The move to grade five and six meant a move next door to Miss McIntyre's. A formidable lady who lived in Moorlands and would walk home after class. There, we were introduced to the map of the world all covered in pink bits. The pink was the British Empire and we were required to learn all the places that 'belonged' to Britain. History also became world wide and, as the war was not that long over, we had to learn all about that. The sums became harder too, fractions and (the bane of my life) mental arithmetic. This involved the teacher firing a question out of the blue at some poor unsuspecting pupil. If it was me, my brain would just freeze up even if I knew the answer. This brings me to the sore subject of 'The Belt'. Who can forget the leather straps that lay in the teachers desks. Most children knew that bad behaviour- like bullying or pulling someone's pigtails- could earn them a stinging hand. What was unfair though was to be punished for making a mistake in your work and I saw that happen quite often. It was in primary five that we were, at last, allowed to use ink. This in itself was an experience as school ink back then came in powder form to be mixed with water and kept in the store cupboard. Some lucky boy or girl would then be given the job of filling the inkwells. These were arranged on a tray and carried round the room to be placed in the round holes in the desks. The pens, also from the store cupboard, were pencil shaped pieces of wood with a metal end. Into this metal end a "nib" was inserted. You hoped to get a good nib as one that had been leaned on to heavily splayed out and made nice writing impossible! We also made good use of a small square of blotting paper. Ballpoints were around but not allowed. One day a girl turned up with a beautiful fountain pen. She told the teacher her father thought it ridiculous that we had to use those old pens so he bought her the fountain pen for her birthday. I think the teacher was taken aback but allowed the use of the new pen. Everyone else was quite envious. 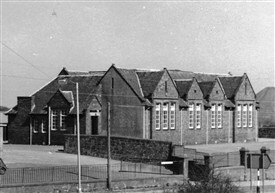 The next step in our education was primary seven, the qualifying class (the qually). The head teacher Mr. Hardy took us for this last year of primary. Looming on the horizon was the dreaded 'eleven plus' or the 'intelligence test' as I remember it being called. The build up was quite stressful for some as the results would decide where you were placed in the high school. Me, I couldn't have cared less: more fool me. What a wonderful thing hindsight is. We assembled in the gym hall where desks had been set up in such a fashion as to isolate each pupil as much as possible. The head advised us that if anyone needed the toilet they must go before the start of the test as no one would be allowed to leave the room until it was over. When we were all at our desks the test papers were laid face down in front of us. We had been forewarned not to touch them. Then, checking his stopwatch the examiner said, 'turn your papers over and begin.' We had an allotted time to complete the paper and two assistants patrolled the room keeping an eye out for cheats. I can't recall how long we had, but it was a great relief when told to lay down our pens and turn our papers face down for collection. And so it was decided where in the high school we would be placed, a choice of five different streams, if I remember correctly. This page was added by Margaret Foster on 20/10/2012. Margaret has excelled as usual in her memories of school in Addiewell. She could be describing St Thomas' school down the road- all that was different was the name of the teachers. We, of course, had many visits from Father Mohan, the parish priest, and he would ask questions too, as if we needed more questions! I clearly remember one Ash Wednesday, Kit McKee and myself were strolling round the school idly and we met the Priest's housekeeper (a tyrant of a woman) and she asked us what the Ashes on our brow meant. Well neither of us could answer and as a punishment she made us pick up all the leaves in the driveway to the Chapel. When I got home and told my mother what she made us do she marched me back down to the school and informed Mr Brady we were there to be educated and not to pick up leaves. She then headed for the housekeeper and let her know, in no uncertain terms, she had no duristiction over any child in the school and to mind her own business- that day the housekeeper met her match! As children we would never have dreamed of refusing to obey orders. I also remember the great snowball fights the two schools would have at dinner time and I clearly remember George Weir, who was the tallest at your school, leading the attack. Years later we would all be together in the Poly Hall in Cauther at the dancing (no Discos then) and the snow fights were long forgotten. I look forward to your memoirs of life at the High School. I had forgotten about the snowball fights lol, but I remember the Poly and the Friday night 'latenights.' When the bus bringing us home went all round the world before we got to Addiewell. The Poly was a great meeting place.